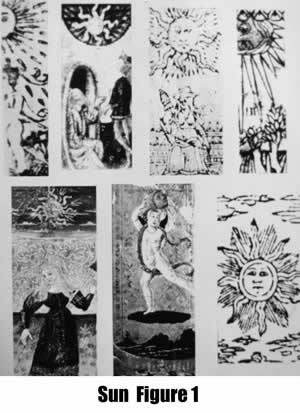 Seven images of the Sun card have survived from the 15/16th centuries (Fig. 1). All of the images of the Sun are shown as a full circle with rays and a face. The rays are straight on 3, curved on three, and one card shows both curved and straight rays. Two show a woman in a garden spinning yarn. Two show just the Sun. 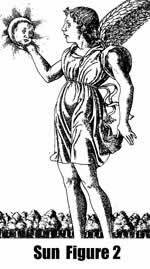 One shows a cherub carrying the Sun across the sky. One shows an older man speaking with a young man. One shows a child (perhaps one of two) and has tongues of fire falling from the Sun. There is an additional card that may be from the 16th century (Kaplan Volume 2, p. 288). This shows a naked man uprooting a tree with a fountain in the background. The Sun as a ruling planet with its 'children' can be found at www.billyandcharlie.com/planets/sun.html. 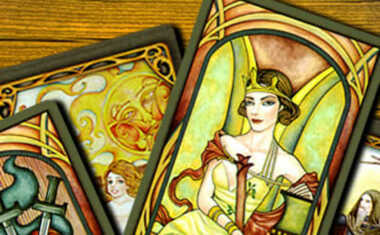 which illustrates the astrological associations that the card-players may have been familiar with. 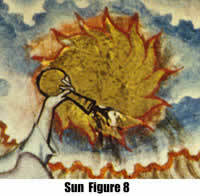 A similar representation of Sol as a king holding the Sun can be found in Seznec (1953, fig. 64). It is interesting, however, that the early Tarot cards do not include the manish arts (wrestling, fencing, rock-tossing) traditionally associated with Sol. The image of the angel carrying the Sun across the sky may be a Classical reference to Iliaco, the 'genius' of the Sun as in the so-called 'Tarocchi del Mantegna' (Fig. 2). I have not been able to determine a source for this concept of Iliaco. The Latin form, Iliacis, is used by Virgil in the Aeneid as an adjective referring to someone or something from "Ilium" or Troy. The Latin word, in turn, is taken from the Greek, i.e., from Homer's "Iliad". Whatever the source of this Classical reference, it is interesting to note that this image appears only on one of the hand-painted decks. As we saw with the Moon and Diana, such Humanist references were of greater interest to the literate aristocracy than to the ordinary card-player. While the card-players were unlikely to recognize a reference to 'Iliaco', they were certainly familiar with the Sun as a symbol for Jesus. The basic source for this identification is Matthew 17:12: "...Jesus took with him Peter and James and his brother John and led them up a high mountain...he was transfigured: his face shone like the sun...". The theme of Jesus as the Sun of God, the Light of the World, is amplified in the first chapter of John's Gospel: "In the beginning was the Word...All that came to be had life in him and that life was the light of men, a light that shines in the dark...The Word was the true light...". Jesus as the Light of the World is further proclaimed in John 8:12, 9:5, and 12:46. The symbolism is reinforced by Augustine who refers to Jesus as Incorporeal Light (City of God, Book 11, Chapter 3, Walsh et al. 1950) and as Unchangeable Light (Confessions Book 7, Chapter 10, Ryan 1960). From the earliest Christian times, Jesus was identified as the Sun of God, the Christianized Sun god, Apollo (Fideler 1993). The almost immediate assimilation of Apollo, the invincible Roman Sun god (Fig. 3, from the 3rd century) into images of the Sun of God complete with radiant halo and Apollo's chariot, is nothing less than remarkable. Figure 4 is a mosaic of the Sun of God from a 4th century mosaic in a Christian catacomb. By the 11th century (Fig. 5) it is difficult to determine if the center of the Cosmos is the Sun god or the Sun of God. 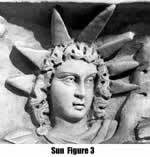 The history of the Sun as a symbol of Jesus is dealt with in considerable detail by Shrimplin (2000). In her analysis, the symbolism reaches its pinnacle and culmination in the representation of Jesus in Michaelangelo's Last Judgement. "And our great fame that sounds so lofty becomes nothing but a second death...Thus triumphs Time which hastens so quickly that all our glory and fame is defaced." Petrarch's identification of the Sun with Time has deep roots in medieval culture (Gurevich 1988). The movements of the Sun set important parameters of time, i.e., day/night and the seasons. The card-player would ordinarily mark time during the day by the movement of light and shadow. Even mealtimes were established by sunrise, by the Sun at zenith at noon, and again by sunset. So the association of the Sun with time would have seemed natural. And even though the illustrators of Petrarch did not use the Sun as the symbol of Time, nevertheless, the triumphal Sun, coursing through the heavens in a chariot, was used in other contexts. Such an image appears in the so-called 'Tarocchi del Mantegna" (Fig. 6). A related image can be found in a 1066 Psalter (Jung 1944, fig. 206). As we have seen in earlier chapters on the Heavenly Bodies, the Sun appears in many places in John's Revelations and in the artistic tradition that developed from it. Thus, the sun appears in Durer's print (Figure 7) of the opening the fifth and sixth seal (Rev. 6:9-12). Related images can be found in Hassall (1961, plate 4), van der Meer (1978, fig. 143 and 192). Similar imagery is associated with the blowing of the fourth trumpet (Deuchler et al. 1971, p. 51 and Hassall 1961, plate 7). In addition to imagery of the Heavenly Bodies, there is also imagery unique to the Sun. For example, Rev. 16:8 "The fourth angel emptied his bowl over the sun and it was made to scorch people with its flames..."This verse led to 14th century imagery such as Fig. 8. Similar imagery illustrating Rev. 16:8 can be found in stained glass windows of ~1405 (van der Meer 1978, fig. 99) and an early 15th century manuscript (van der Meer 1978, fig. 153). Other imagery unique to the Sun is related to Rev. 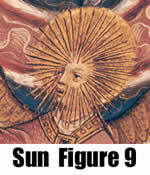 10: "Then I saw another powerful angel coming down from heaven...his face was like the sun..." This reference to the angel with the face like the sun inspired images such as Figure 9 from a Flemish apocalypse ~1400. A very similar image was used by Durer in 1498 (van der Meer 1978, fig. 194). It is clear that illustrations of the sun were the common property of cosmologies and escatologies, both secular and religious. 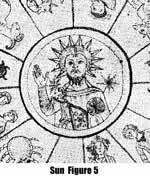 By and large, the images of the Sun on the early Tarot cards are simple and straightforward - a circle with a face and radiations. Two of the images have a more complex face. Shrimplin (2000, figs 99, 100) shows two 15th century illustrations for Dante's Divine Comedy. The Sun in these woodcuts is essentially identical to the elaborate faces that appear on the Tarot cards. This was simply another of the ways an artist was accustomed to drawing the sun. The resemblance of the Tarot images to traditional images of Apollo, the Roman sun god, may not be coincidental and might have been suggestive to some card-players. 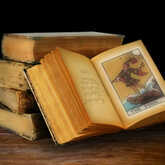 However, the Humanist introduction of classical references was largely a phenomenon limited to the literate nobility. The more likely association in the minds of the ordinary card-player would have been the passage of time. This association would seem to explain the women spinning - working while the Sun shined. This may also explain the child playing in the garden in the sunshine. It is not clear if the image of the old man can simply be explained as instructions to a student on cosmology and time. Beyond the cosmological, the Sun was a familiar symbol for Jesus. Shrimplin (2000) provides a detailed analysis of the history of the Sun symbol and its identification with Jesus and the Last Judgment, i.e., the next three cards in the Tarot deck. The identification had worked its way from biblical sources to theology and thence to literary references such as Dante and to artistic representations. The Sun card would most likely have been seen by the card-players as a happy and peaceful symbol. The darkness of the cards from Death to Star have been overcome and the sun appears in its brightness and warmth. The Sun was both the measure and the director of time (Gurevich 1988). The Sun brought the warmth of summer when children can play naked in the garden. The Sun determined the division into work, such as spinning, and sleep. Darker images of the Sun, such as those associated with Fig. 8, do not appear to have been incorporated into the Tarot. But in spite of the brightness of the Sun images, the late Medieval fascination with Death, Judgment and the 'last things' remained a part of the popular culture. The Sun as the last of the series of Heavenly Spheres must have occasionally aroused an association of the symbol with the apocalypse. Such an association might have occurred, for example, when the card-player noticed that the next higher card in the sequence announces the Resurrection and Last Judgment. It also seems likely that the Sun would have been seen as a religious symbol. All their lives, the card-players had been told that just as the Sun is the source of all terrestrial life, so Jesus is the source of all spiritual life. The Sun/Light symbol for Jesus was pervasive in church art. So, although it would not likely be the first thing that crossed the card-players' minds, the Sun of God was certainly a familiar idea. It is probably pushing credibility to suggest that the ordinary card-players would have thought of a mystical connotation in the Sun. Nevertheless, we should not dismiss the idea offhandedly. They had certainly been exposed to the idea of the mystic being taken up through the heavenly spheres. They had heard the Old Testament story of Ezechial being carried up into Heaven. They knew of the Assumption of Mary and the Ascension of Jesus. Though they would probably not have identified such a journey with their own lives, they were aware that such an elevation was possible.